Like car spotting. This old Amazon Station Wagon with slot mags wheels and other attributes from the 1970-ties sure was nice to see. The registration sign message was correct and that was probably what someone recently had done. Or Turbo quality time: Look at it for awhile, then close your eyes and dream about howling engines, sunshine and tire smoke. Or an in-between engine project: Few things are as effective as a engine tuning project when it comes to adjusting work-life-balance. Yes, it works even if you work with engines 9 to 5. Strange isn't ? Or get fully focused and try to start stuff. Or create something: Yes, but what the f..is this? Should we try pesticide? Better not, since this is an essential part of Magnus making magic. Soon to appear on something wild. Or enjoy garage cooking: Petter's Garage Wok -gives you strength to keep on working and dreaming. It seems like we are on the news ? But like a thunder and ligthning we were struck by today's news which we, for once, were part of. For us it became the enhancer of our adventure and dream, Helena managed captured it all. In a tender and relevant way she manged to capture a real and actual feeling versus fake news. Please enjoy and imagine our love affair with the salt. We're happy to be able to share this with You All. And again. You ain't seen nothing yet. Of course we've to learn and work hard as hell before we reach the next level. What was orginaly intended as local news ended up in Rapport which is big news in Sweden, Prime time. Take a look at above link ! We will try to make to make the full interview available as soon as we have OK to share it. As the summer turns in to autumn the activity in the Salt Slush workshop is good. But when as the Nordic darkness comes over us with full power in late October early November not even Salt Slush team has the energy to stand strong. When this happens we're just sipping coffee and try to stay sane as we're tumbling around between dream and reality. We're waiting for energy, exitment and execution. And yes, yesterday was the day. We were bursting in to furious activity! One successful moment were followed by yet another victory. Triumph after Triumph. Magnus managed to celebrate a rolling chassi. No, he's not ready yet. But he sure as hell know what he wants. And it'll be fun and fast. Currently, he need some assistance though. The "Spokesperson" Petter the Professor is learning how to spoke a wheel. Initially, he stated something like; -If' you can count to 4 you can spoke a wheel. He has revised that statment. But still, the wheel is now round. ...he fired up his old flathead, that has been sitting in junkyards for a long period of time. He didn't even change spark plugs! Yes, it's running! And how about this? Kalle managed to put his model A (also called Särimner from the Nordic Mythology) together and take it for a spin around the block. Runs like a Cadillac...almost. Summary: Salt Slush team has accepted the darkness. We've found energy and we're prepared for the winter. Full speed ahead! Gasoline Magazine (11 2017) and get some nice pictures and a good story. capturing what we in Salt Slush Racing like and focus. Green reminds us of the summer, which we need in dark November. You who know the drill knows that darkness give us a lot of garage quality time. Although in combination with some busy and fun work at our daytime work by Volvo Cars and Boeing. Tech inspection. Phuuu it worked out... but yes, we still have a list. We should also say Thank You to Tech Spec Team who guided us through the different important steps and gave us the opportunity to fix the most urgent issues and conducted another inspection later the same evening. The long way to El Mirage. Special thanks tp Magnuson Superchargers. Your trailer and Truck (Yes, with a Magnuson blower) made transportation a pleasure. We spent time with learning lesson no 1 in the land speed racing school. We all strongly remember the first rule. Don't be that guy ! if it was for real. if some one think how hard can it be. It is different and will keep us busy many years. Go out and buy ! And get some inspiration. The 449 SSR Amazon is resting in Erik H's garage. Meanwhile we're planing for next steps. 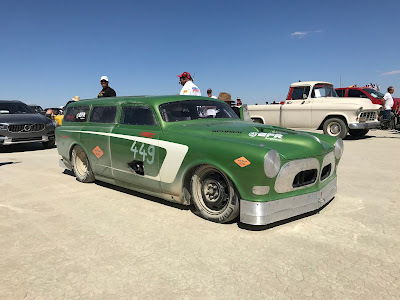 Go to El Mirage when there's no racing going on to train and get a good feel for the car. 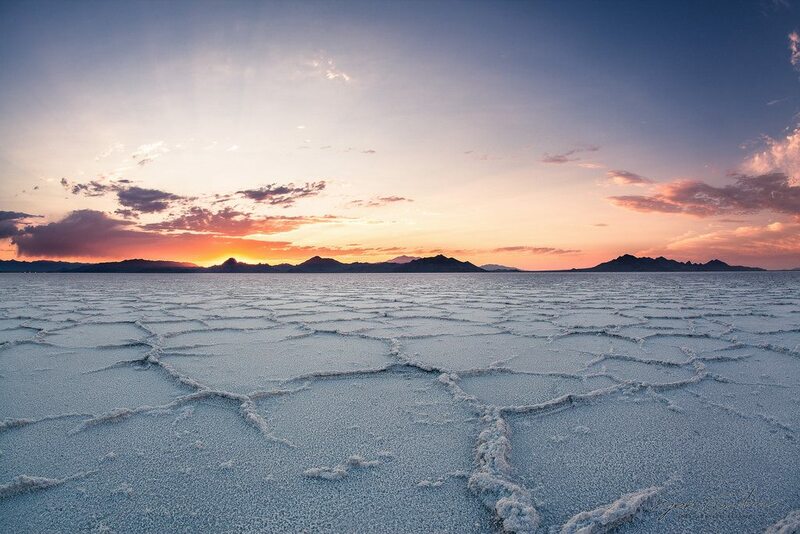 Go back to US for the speed week at Bonneville. A good thing that comes with being a car guy is that you learn about all kinds of stuff all the time. A new problem (something is broken or not broken but needs to be fixed, or at least, it feels good to fix it) or a real opportunity (fantastic new ideas that need attention) emerge and hence you need to think and act in order to move forward. A positive learning process that does clear up a worried mind too. The down side is that you constantly need to figure out how to solve rather complicated technical issues. To cut it short, here's the situation; Carina want an Ardun V8 Engine and yes, a man's gotta do what a man's gotta do. But in the process of transforming an old flathead to a OHV Hemi Ardun I'm currently facing a hot topic. I'm talking about welding and not just any welding, it's cast iron block welding that's the problem or rather the question. When an Ardun head should be applied to a flathead the so called relieving between the valves has to be removed. But how? Is it possible to mill the deck 2mm and make the surface flat? It would be easy, but will the deck be thick enough? Isn't that like welding the surface of an old cast iron frying pan? With coked oil deep in the metal structure? At least there are people out there that are (reasonably) comfortable with welding cast iron without pre heating. To pre heat a flathead V8 engine block would be a bit awkward. With the Amazon at Erik Hanson, in CA, we're on our own. We're alone with our dreams, our inner conflicts and our schemes. Hence conflicts evolves. The Salt Slush team is tight, but our minds are thorn apart by our individual need for speed, crave for craze and magic mechanic machines. Carina (Cina) loves the Ardun Engine. She think's it a magic machine. Here she's home at Erik H looking at one of his ongoing projects. With an Ardun Engine. From another angle and another view. The Ardun Engine from Ferguson....and I admit it's super cool. When building an Ardun Engine you basically create a modern fast burning hemi engine without cooling issues based on a legendary engine from the 1930-ties. And yes, it's a piece of art. And yes, it has heritage. But...I love boosting and boosted engines. 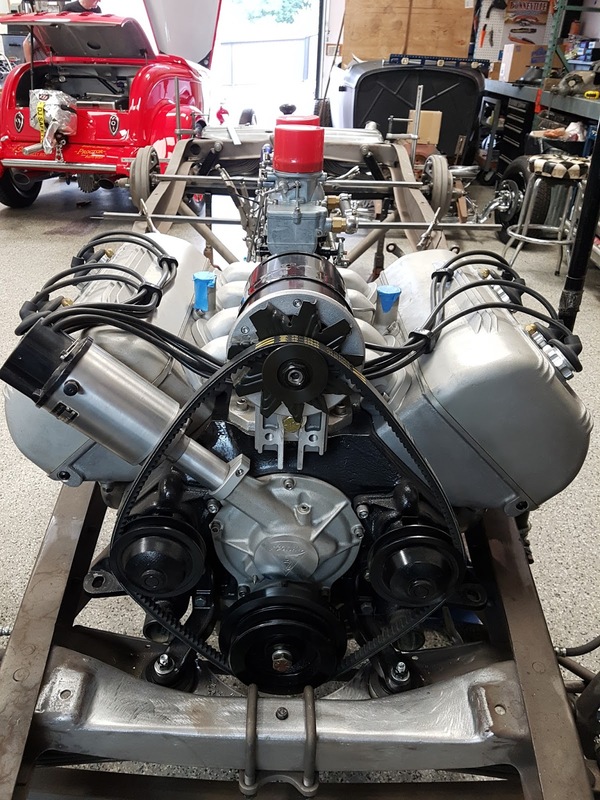 No matter if it's a modern downsized 6 or 8 cylinder DI turbo engine, an LS V8 engine with Supercharger or Turbo or a Flathead with Supercharger. So what should we do? Ardun or Supercharged flathead? Our Ford -46 need long term a new faster beating heart. We need therapy. Engine therapy. There are people that doesn't have a project and there are those that doesn't even want one. How they survive is nothing but a mystery. Then there are others. People who need a car/bike project as much as they need air to breath. Who needs to the positive creative distraction from all daily activates that a project brings. Then there are those with Multi Project Syndrome, people who have a million ideas and more on going project than they can count. Some of these projects are strictly virtual while some are ongoing. Ongoing means that parts are being bought and wrenching has begin. We spent a couple of thousand hours on our mean green machine and we're thinking about and planning for the next steps with our Amazon Land speed racer. We'll be back in US of A 2018, but right now our hand are tight sine our Amazon is in US and we're in Sweden. This doesn't mean that we're lying softly on the sofa. Nope. Instead we've started to work on other projects that are on our lists. Projects that was in previously in minds only was initiated one cold dark evening this week when Magnus, Anders, Carina and I took Carina's C20 pick truck (which by the way could do with a 4LE80 transmission) and drove out to Tomas Terräng to pick a few flathead V8's. 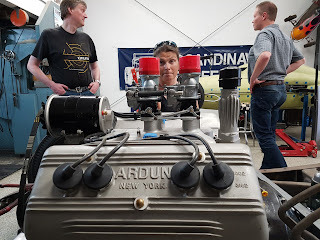 Dark and cold outside, but with one V8 under the hood and two V8's on the truck bed, dreams about old school supercharging, Ardun heads comes naturally. A warm feeling. The Franco-American Flatheads V8's resting in our workshop. And no, these engines are not aimed for Anders El Camino...that's another project that needs a transplant to a more modern heart.